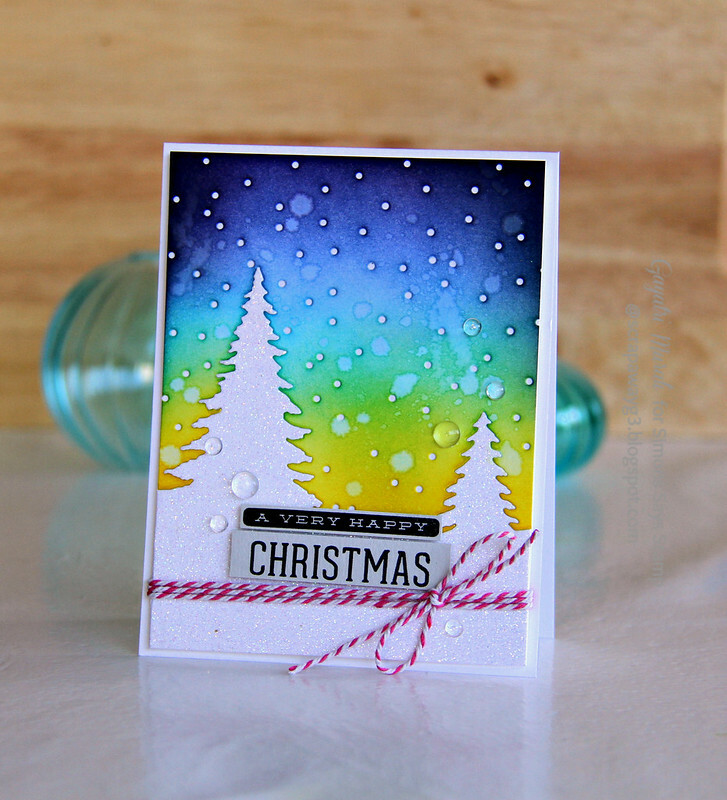 I have a new Christmas card share using new products from Simon Says Stamp Create Joy release! I am so excited with this release. 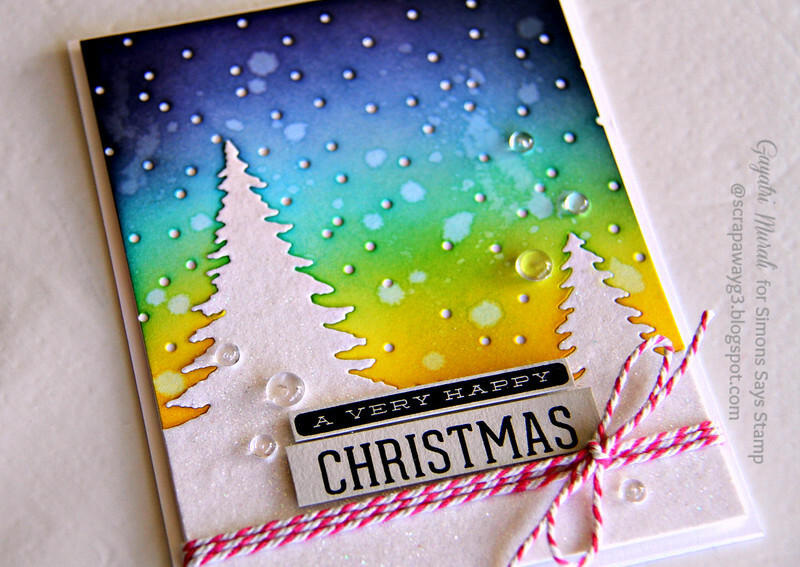 So many fabulous holiday stamp set and dies release just in time to make your Holiday/Christmas cards. I love Soft Snowfall die the moment I saw it. I think this die is designed very cleverly. One die cuts the top and bottom separately. Then you can work with each piece separately and then combine them to make your card. Or you can use the bottom piece on its own as well. This die also make a beautiful window or frame for a shaker card. I told you, such a genius die and a must have in my opinion. I decided work with both the top and bottom piece of the die cut. Here is my first card first for you. I started with running the die on white cardstock panel to die cut both the pieces. I also ran the die on a white glitter cardstock and I will be using just the bottom piece here. I created a night sky using the top piece by sponging distress inks. I have used Mustard Seed, Tumbled Glass, Broken China, Faded Jeans, Seedless Preserve and Black Soot. I sponged them back and forth to get a nice blend. Then I spattered some clean water to add some texture. When I placed this piece on a white cardstock, the white shows through the holes making it look like falling snow against the night sky. Just beautiful! I layered and glued the white bottom piece and the white glitter bottom piece to get a bit of dimension.I adhered both the top and bottom piece of the die cut on a white card panel. Trimmed quarter of an inch on both sides because I wanted white border around the panel. 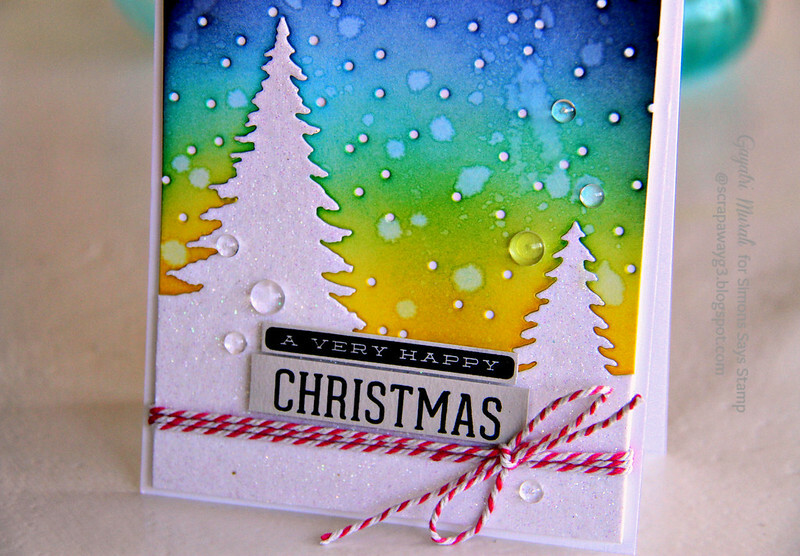 I added stamped sentiment from an older and my favourite stamp set called Holiday Hello thereby highlight the Soft Snowfall die on the card. I added red and white baker’s twine and Pretty Pink Posh’s Clear Droplets. Here are some closeup of the card. You can find all the new products from Create Joy release at Simon Says Stamp Store. Just gorgeous! You create such wonderful cards! this certainly is an incredible die. Lovely card. Very beautiful card!! Love it!! Love the inking on the background!! Beautiful background Gayatri. Love the pretty scene.